Back to: Gadget Patrol: iPad, a month on | Forward to: Spies! The Bath store had a copy or two (minus one, now) tucked away in SF. I didn't see any up front, but then they were remodelling. Yup, picked up a copy in Glasgow on Saturday. It's waiting on me re-reading the first two though. Amazon UK sent me an email to confirm it had sent mine. I can't wait! I am currently in Miami but returning on Thursday for a flight to Dubai on Saturday - with The Fuller Memorandum! Yay! It's out a few days early?! Woohoo! Shall have to go visit my local Waterstones and see if I can snaffle a few copies for myself and my friends.. Grabbed mine from Waterstones on Saturday and was completely blind-sided by the 3 for 2 offer which meant I then *had* to by two more books. Finished it yesterday and I don't think it's spoilery to say that this is the best Laundry novel yet and I was a huge fan of the Atrocity Archive. So thank you Charlie! Will get mine from "Forbidden P" on Wednesday ... Hooray! I have a question. Your books are in the Sony e-book store. Do they go up as soon as they are released, or is there a delay? You may not know, but I thought someone here might. If the Fuller Memorandum becomes an e-book on the 6th of July, I'll probably buy it online, but if it's going to be a couple of weeks, I'd rather have a hardcopy. Derby Waterstones has it in their 3 for 2 offer... Minus one book now of course! Your answer is: I have no idea. Nor do I have any control over the timing of ebook releases. In fact, when I've asked, my editor doesn't know either. Waterstones in Leeds is out of stock (yes, they'd got some in - I asked). More are on order. mine came home with a copy of 'H2G2 6th of 3' and a novel about the miner's strike 'GB84', (it's always a challenge finding the 3rd of 3 in the shop) guess which got read first. rather have had a copy of Ken's book, but I guess I'll have to wait a few weeks for that deal. I loved Bob's not so pop references, soothes the savage id when you recognise them. Laurels nice and crushed now, Charlie? My preorder with Amazon shipped today, look forward to reading it tomorrow! Ah, is it paperback only in the UK for now, or am I missing something really obvious here? Cos ou're one of the few writers I buy in hardback. I wonder if a possible universes can only exist in which, at some point in its existence, its own conception can be achieved within itself, justifying its reality, if that makes any sense. I wonder if that's how they reproduce. Paperback edition only in the UK, hardcover in the US. #2 in SF on Amazon UK, #50 in books, as of today. Not bad -at all-. That's a bestseller and no mistake. Nope. Lee Smolin's idea of mother universes begetting daughter universes via a black hole "reproductive" mechanism didn't pan out. And the entire basis for Cosm by Gregory Benford. I have never heard of Lee Smolin or Gregory Benford, I will look into them. I'd be astonished if the 3 for 2 offer (not 2 for 1) runs for less than a month. As for my royalties, thank you for your concern -- but I can't tell you. I get a percentage cut of the cover price, but it can be affected by the size of the discount the retail outlet gets from the publisher, the number of copies sold, and the phase of the moon. (Er, that's Phobos, not Luna.) In general, the more copies sold, the deeper the discount -- we're into bestseller territory where the trade discounts can go as high as 70% -- but the higher the royalty escalator (if your agent is doing their job right, once you're into bestseller quantities your royalties go up from, e.g. 10% of SRP on undiscounted hardcovers to 15% -- although the discount will chew into that). My Amazon pre-order arrived today. I've only had a chance to read the opening section of the prologue but... oooooohhhhh.... spine-tingling stuff! I cannot wait! Fingers crossed but hopefully congratulations are on the way for hitting bestseller status. Best wishes for that; now what would be really impressive would be if the book makes the ST lists! (highly deserved but sadly unlikely). It must be something of a mixed blessing--sales and discounts--to get onto the shelves at a supermarket in the UK, but it's that little bit closer a prospect, now. I don't know that 3-for-2 deals are that big a thing, but it can move things up a notch. Trouble is, you next book will be different enough to be, well, not the same. Cosm is a good book. I have high hopes for the LHC (yes, I know its a different collider, but hey...). My copy arrived from Amazon yesterday. I'm about 3/4s of the way through and my opinion is that it's the best Laundry novel yet and if the series is heading where it seems to be telling us then we're in for a bloody awesome ride. For anyone interested the UK Kindle edition is out on July 1st. The current theories all talk about "Branes"(aka Membranes, hence the name M-theory - a synthesis of string theories and supergravity needing 11 dimensions to operate). Collisions between (11-D) branes resulted in our (4D) macro-universe. M-theory implies/forecasts(?) that such 'big-bang' collisions are the norm not the exception. Parallel universes are now mainstream! IIRC M-theory was the subject of a special feature in Scientific American a couple of years ago, and has also featured prominently whenever New Scientist ran any features on cosmology (at least once a year). Got mine at my local borders last night. I've had good luck scoring Laundry novels there before official release date. Here's to them! And here's to my deteriorating sleep schedule as I stay up far too late to read! Just ordered mine from Amazon. I'd have preferred to go to Waterstones but I usually have problems making up the 3 books for a 3 for 2. The long-predicted transport toy the FLYING CAR has apparently arrived, in the USA, at any rate. 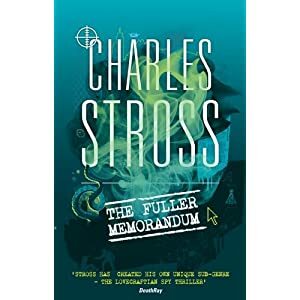 So you are now officially "the best selling author Charles Stross". And a major high street chain has given you, a genre fiction writer, to the coveted 3 for 2 promotion slot. It's interesting to think about this a little. We're looking at the book being a very popular preorder. That's not actually an indication of bestseller status - all these people are buying the book based on the cover page. That's more a statement about the popularity of the series and Charlie himself. Here's hoping it lives up to those expectations. "And a major high street chain has given you, a genre fiction writer, to the coveted 3 for 2 promotion slot." That's less significant than you think. Half the books in Waterstones are on the "3 for 2" thing. It's how they compete with Amazon's lower prices. Having just finished reading, its all ver' ver' good! I was struck by how cinematic the climactic scene was. I don't have any kind of visual memory (perhaps because my eyesight is better than yours but not by much) but I could see what that police helicopter saw in my mind's eye. And I was laughing my head off (not the normal response to someone seeing an event like that, but of course We Know The Truth behind it: a lovely inversion). I felt _The Jennifer Morgue_, while excellent, tilted the balance of horror/humour that is the Laundry books' driving force a little too far towards humour; while DEEP SEVEN is slightly frightening and seriously powerful and alien, they don't really want to kill everyone, they just want to bugger off and attack BLUE HADES. But some of this book, well, it gave me the shivers the way nothing had since the first sight of the moon in the first book (well, in Spectrum SF 8). I spotted a few typos: is a list of them any use to you? Many times I've intended to buy a book that Waterstones had put in a 3 for 2 offer, but in the end left empty handed because I couldn't find the third book... and without it I felt like I was losing out somehow. Newcastle branch has some on display with their other 3 for 2s just inside the main entrance, quite prominent. I'd choose Iain Bank's "Transition" as my second book, but I'm very keen on recommendations from people (non-fiction or fiction, any genre) for book number 3. Have you read 'The Trouble with Physics' by Lee Smolin? To all string theoriests: Test something. ANYTHING. Test or GTFO. Oops. My Off Topic warning tags were removed from the above due to my failure to write them in psuedo mark-up. No, assuffield, it is less important than you think. No, but I've made a note for a future visit to Amazon. Incidentally, I always use "[...]" for action tags etc, because of HTML engines' unprincipled attitude towards angle braces. Waterstone's Gower Street clearly had sold a couple of copies, and it was well positioned on the heaving table of SF. My copy and the additional one I accidentally ordered (do I get a star?) arrived yesterday. Perhaps this goes without saying but just a note to say that play.com isn't the place to pre-order from! After all the amazon-bashing earlier in the year I ordered TFM in April from play.com. They're still showing it as "due for release 1/7" though, and my order status as "pre-ordered". After waiting impatiently but feeling virtuous about avoiding amazon I'm not best pleased about hearing that I could've had it days ago from the evil ones (or my local Waterstones etc), plus it would've helped Charlie's sales ranking (not sure that an order from play.com will register for charts anywhere). "Digital Culture, Network Culture, and What Comes Afterward"
I'm not going to bite your head off. Sorry if this has already been covered, but will The Fuller Memorandum have a special edition? And does a higher price mean more money for the author? No special editions, alas, unless you count an SFBC book club edition. Yes, a hardcover pays me a greater percentage royalty (on a higher cover price) than a paperback or a book club edition. NO COPIES of "Fuller" AT ALL - hadn't arrived yet. I'd be interested in a free-form discussion forum. These days, other than chance meetings and/or recommendations at SF cons (which happen to be how I came to buy my first Charles Stross book) I get most of my "new to me" author recommendations from internet fora who's regular posters have similar interests to myself. Similarly, play.com order now changed from "pre-ordered" to "waiting for stock". Mmm, is that a "cancel order" button I see before me? Just spent my lunch hour establishing that Waterstones' flagship store in Glasgow is sold out (their stock system disclosed one copy tucked away in the SciFi section but I already knew a lady browsing that section had it in her hand). The staff in the sci-fi section hadn't heard of it and were utterly "un-bovvered" by the fact it's #1 in sci-fi on Amazon and that they have no copies. Definitely the place to go though if you want a copy of a ubiquitous celeb autobiography without the usual discount (or an average cup of coffee in a dingy basement). Still none of the Stross oeuvre bothering the copious bookshelves in the nearby flagship WHSmith. How can I have pre-ordered this book in April and still be unable to physically get a copy? Gah! Not looking good for Charlie's Chart Run (TM) if there aren't any copies on any shelves. Play.com (who took my money in April) still saying "awaiting stock". Amazon - there is apparently no alternative! May be forced to go e-book. The Apple iBook store only has Wireless so far. The Waterstones ebook store doesn't have it either (quelle surprise). The Amazon Kindle store has it for 8.89 USD though (and despite the dollar pricing, it's the UK edition produced in France according to the free sample download). Even Waterstones' online store appears to have sold out of dead tree editions ("usually shipping in 3-5 days" it says). Found my HB copy from thebookdepository had come, when I arrived home this evening. I was getting a little impatient so I tried my nearest Waterstones (Trafalgar Square) at lunchtime - no copies to be seen on the front tables, or in the basement SF section, not even in the Stross bit. (I was seriously considering buying the PB as well if I could find it). davharris: Private Eye had a thing a few months ago (perhaps as long ago as last Christmas?) laughing at Waterstones for their utterly appalling new central ordering system, which local staff hate because it completely fails to reorder books which sell, or preorder books by authors who sell, even though you'd consider this a major purpose of such a system. I suspect you are seeing a consequence of this. My brain's drooling and I'm barely halfway through. Wondering if I've spotted a continuity error or two. I'm afraid that Waterstones' appear to have lost the plot. Result: They had had ONE copy - which had ben sold, but the Fleet Street Branch still had one ... so she headed back to the office, which is near Fleet St, and got said copy at lunchtime, and yes, that branch bnly had ONE copy, as well. Sitting beside me on the desk right now. Don't these people (the organisations, that is, not the actual store-staff) WANT to sell books? I went to the smaller Glasgow city centre branch of Waterstones last night (still a 3 or 4 floor shop mind you) and bought their one copy. It was on their "new crime fiction" display at the front of the store, not hidden in the Sci-Fi section, although the other (mainstream fiction) books on that display had multiple copies stacked behind the front one. I'm obviously delighted to get it and am enjoying it greatly, but am feeling slightly guilty for removing the store's only copy from the front of store display. Lest this sound like I didn't think it was up to snuff, I spent most of my day yesterday in the English Market in Cork, swilling coffee and burning through the novel. My copy arrived yesterday and I managed to read it in one sitting after getting home from work. Now I am knackered and it's all the laundries fault, so i'm going to bugger off and make tea. Anyone want some? Popped my head into Waterstones on the way past today. The empty space in the new Crime display left by the sale of their one copy of TFM has been replaced by a pile of Daphne du Maurier (Jamaica Inn). I suspect this may be the first time that Charlie has had Daphne du Maurier substituted for him. Curiously, the Book Depository have it listed under eBooks as "out of stock". In fact, they have quite a few eBooks listed out of stock. By what bizarre business model would a company get low on e-stuff, did they lose their file copy command? You don't see that on iTunes / iBooks! This is a must have on my summer reading list - I will get the dead tree version as soon as I can get to Waterstones. My best suggestion for how an e-book gets to be out of stock would be that the publisher sells the retailer licences for N copies, rather than relying on the retailer reporting that they have sold M, and paying M*cost to the publisher. You can then get a situation where the retailer has sold all their licences, but hasn't ordered/received a new batch. Wow, just finished reading "The Fuller Memorandum". Absolutely brilliant and a great follow on from the other two in the series. I just have one observation and one question. It was over to quick, so I guess it's back to the Jennifer Morgue & Atrocity Archives for another reread. The question, however, is When can we expect the next in this brilliant series? Success - the Oxford Waterstones had a pile on the table in the 1st floor SF section (though not on the main tables on the ground floor). Managed to present it on return home as the "free" book in the 3 for 2 and therefore not an indulgence (given that I already had the hardback). Just finished and enjoyed the book. Definitely darker than the Jennifer Morgue. I liked the double bluff on CASE NIGHTMARE GREEN. One pedantic point. Page 12, you call the RAF Museum North London site Duxford. In fact the RAF London Site is Hendon. Duxford is a good few miles north of the M25 on the M11 and is a branch of the Imperial War Museum. Spolier Alert - look away now if reading... I live near and have visited Brookwood cemetry - nice touch having something scary happening nearby. It was similar to when I realised that H.G. Wells Martians landed only 10 miles away from here. In which context Charlie, you'd enjoy a visit to the RAF Museum, Duxford. For best value, try and go the day before an air display, when you pay the normal admission price, get the less crowded site, no queue to get off the M11, and can watch people doing their display certifications. ...and an SR-71, which I spent nearly a full hour looking at. Do you guys have any idea how often Charlie and Feorag see aviation museums? When they were here in DC, we went to Udvar-Hazy near Dulles airport (and Charlie kindly pushed me in a wheelchair). Yes thanks Marilee, which is what makes him mixing up RAF Museum Hendon and Duxford sites distinctly surprising. For those who are interested, I chose "in defense of the realm" as my third book. The staff in waterstones newcastle said that the fuller memorandum has been very popular. My till attendant thought that the cover was very eye-catching. All the just-inside-the-entrance stock had gone. This page contains a single entry by Charlie Stross published on June 28, 2010 11:23 AM. Gadget Patrol: iPad, a month on was the previous entry in this blog. Spies! is the next entry in this blog.